FORT BLISS, Texas, Feb. 27, 2008 — More than 3,000 Cana­di­an sol­diers prepar­ing for a rota­tion in Afghanistan are wrap­ping up a pre-deploy­ment train­ing exer­cise here this week that includ­ed U.S.-led instruc­tion in coun­ter­ing impro­vised explo­sive devices. The three-week 2 Cana­di­an Mech­a­nized Brigade Group exer­cise, dubbed Exer­cise South­ern Bear, con­cludes Feb. 28. 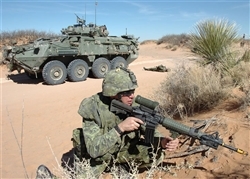 Sol­diers from Cana­di­an Forces Base Petawawa, in Ontario, arrived here Feb. 7 to train for their deploy­ment to Kan­da­har in Sep­tem­ber, Lt. Andrew Hen­nessy, the 2 Cana­di­an Mech­a­nized Brigade Group spokesman, told Amer­i­can Forces Press Ser­vice. Once deployed, the sol­diers will serve with the Kan­da­har Provin­cial Recon­struc­tion Team and as observ­er men­tor liai­son teams that embed with and train Afghan sol­diers and nation­al police. About 80 per­cent of the troops will be deploy­ing to Afghanistan for the first time, but they’re no strangers to tough mis­sions far from home in Bosnia, Haiti, Eritrea and oth­er hot spots, Hen­nessey said. “They’ve had lots of expe­ri­ence in lots of places,” he said. Exer­cise South­ern Bear, spread over a mas­sive area that includes not just Fort Bliss, but also the McGre­gor Range and White Sands Mis­sile Range in New Mex­i­co, is giv­ing the Cana­di­ans the oppor­tu­ni­ty to train for oper­a­tions with both friend­ly and hos­tile civil­ians, ene­my insur­gents, media and Afghan nation­al secu­ri­ty forces. Although Cana­di­an train­ers are lead­ing the gun­nery, con­voy live fire, first aid and most oth­er train­ing blocks, they’ve looked to U.S. sol­diers to help pre­pare them to face impro­vised explo­sive devices, Hen­nessey said. The U.S. 5th Armored “Dag­ger” Brigade, 1st Army Divi­sion West — a hybrid of active, reserve and Nation­al Guard troops deployed here from Fort Car­son, Colo., since July as train­ers — is offer­ing that assis­tance. About 1,300 of the Cana­di­an troops have gone through the “IED-defeat” train­ing so far, and about 150 more are sched­uled each day for the remain­der of the exer­cise, said Army Col. Frank Sher­man, who com­mands 5th Armored Brigade. The train­ing begins with about an hour and a half of class­room instruc­tion. After that, stu­dents get exposed to an “IED pet­ting zoo,” where Sher­man said they get to put their hands on sev­er­al types of IEDs to see what they look like. From there, stu­dents learn to take scraps of met­al to build their own IEDs. “We have them do that because we want them to under­stand what these things are and how they’re built,” Sher­man said. This prac­tice helps ensures that when sol­diers encounter an IED com­po­nent in the com­bat the­ater, they rec­og­nize what it is. “If they know the pieces and the com­po­nents that go into mak­ing them, it’s going to be eas­i­er for them to rec­og­nize an IED,” Sher­man said. With that train­ing under their belts, the troops tra­verse two IED-defeat lanes set up at McGre­gor Range. In the first lane, for dis­mount­ed oper­a­tions, sol­diers spend about three hours mov­ing as a squad. Along a mile-long stretch of New Mex­i­co desert, they encounter six dif­fer­ent types of IEDs, Sher­man said. Next sol­diers move to their vehi­cles — most­ly six-wheeled light armored vehi­cles and eight wheeled Coy­ote recon­nais­sance vehi­cles — to nav­i­gate a mount­ed IED course where they’re exposed to five or six IEDs. “IEDs are one of — if not the — biggest threats we will face in Afghanistan,” Hen­nessey agreed. He said the train­ing Sherman’s troops are pro­vid­ing are a way for deploy­ing sol­diers to learn new skills that will help give them a leg up on insur­gents who might use IED against them. “This is an oppor­tu­ni­ty to learn from the Amer­i­can mil­i­tary and gain from their expe­ri­ences in both Iraq and Afghanistan,” he said. Sherman’s train­ers strive to make the train­ing real­is­tic and mean­ing­ful. They con­tin­u­al­ly insti­tute changes, “incor­po­rat­ing the lat­est tac­tics, tech­niques and pro­ce­dures the Tal­iban is using,” he said. Mean­while, the high-desert train­ing envi­ron­ment close­ly resem­bles Kan­da­har itself, he said. McGre­gor Range stands at 4,400 feet alti­tude, just a few hun­dred feet short of Kan­da­har. It’s a sandy, arid area with­out much veg­e­ta­tion and sim­i­lar fields of obser­va­tion to those in Afghanistan. “Fort Bliss at this time of year looks a lot like Kan­da­har,” Hen­nessey agreed. Con­di­tions here are a far cry from those at the Cana­di­an sol­diers’ home base, cur­rent­ly buried under 3 feet of snow with tem­per­a­tures in the -20s degrees Fahren­heit. “Try­ing to train in con­di­tions like that is pret­ty dif­fi­cult,” Sher­man said. Just as impor­tant­ly, he said, they’ve come to real­ize that defeat­ing IEDs is everyone’s job. “It’s a team effort, and every­one under­stands they have a piece of it,” he said. Hen­nessey said the Cana­di­an troops will rein­force the train­ing gained here when they return home, par­tic­u­lar­ly dur­ing a con­fir­ma­to­ry exer­cise in May designed to cer­ti­fy their readi­ness to deploy.